The National Hardware Show returns to Las Vegas May 6-8 2008.The 2007 National Hardware Show in Orlando featured hundreds of thousands of new products from more than 3,400 manufacturers in nearly 850,000 square feet of floor space including the co-located Gourmet Housewares Show and Global Home Textiles.Retailers and wholesalers could source new products easily through several new programs, like the Inventors’ Showcase and New Product World. 1. Capitalize on emerging consumer trends with real-life merchandising and product vignettes highlighting Staycation; Green; Saving Energy, Saving $$$ ; and the new DIY’er. 2. Big Brands Are Back—to name few – Black & Decker licensed line of outdoor products, Char-Broil, Simple Green, Whirlpool/Gladiator Garageworks, Bond Manufacturing, Hyloft Storage Solutions, DAP, Stanley Tape & Adhesives, COSCO, Bath Solutions, Wayne Water Systems, LDR Industries, Whitney Design , The Designers Edge, WM Barr, Sheffield, Wooster Brush, FHP/O’Cedar, IDC/Westinghouse, 3M, Sisco/Honeywell, Vermont American and MD Building Products plus Face to face access to 2800 manufacturing companies covering the entire market. 3. Proprietary Market Research—unveiling consumer shopping behavior, trends and futuristic outlook of the industry, presented by the North American Retail Hardware Association. 4. Design, fashion and styles roundtable discussions with designers, retailers and manufacturers highlighting lawn, garden, outdoor living and storage & organization. 5. Best practices, merchandising tips and recession-proof strategies to thrive in a down economy. 6. New Product Launch spotlight Unveiling never before seen products that have no distribution and no exclusive deals prior to debuting at the Show… these are TRUE New Product Launches!! 7. Networking opportunities on the Show floor, at Awards Ceremonies and even in the taxi line – chances are endless in opening the door for that next big deal! 8. Great ROI—bring your entire buying team and get a Quarter’s worth of business done in 3 days with inexpensive hotel rates, flights and FREE transportation to and from the Show. 9. Simply the most efficient way to find New Products , New Vendors, and Emerging Product Categories that will Drive Sales. 10. You can make a difference! Contribute to the growth and success of your industry! Garden tools are an important for a home owner. Without the proper tools, the task of repairing or building home projects are tedious and difficult. Despite the new technology of tools, the basic hand tools have remained unchanged over many decades. Shopping for tools can be a frustrating experience for the beginner and the novice. But how do we arrange these garden tools? Here I will introduce you a DIY way to create a tool box, which will make your all tools be put by types and in tidy. Create a mini gardening center that you can tote while you tend your plants. Start with a carpenter's nail belt, which has one big pocket: Measure the width of each tool, such as a trowel, then add an inch for extra space. Use a pen to mark widths on belt. Stitch along marks, creating several pockets. Tie the belt around a bucket, which you can use to hold larger items or to collect debris. If you take this one step further and use bungy cords, you could stablize the bucket on a luggage dolly. 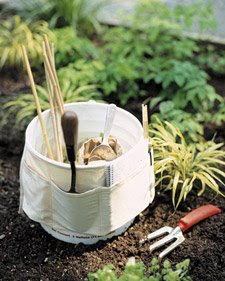 And you can even "wheel around" taller items in the bucket easily, anywhere in the garden - and it is easier on your back. Garden rakes is one of the most important tools to collect leaves and other garden debris. We could use it for preparing the soil to plant your garden. Garden rake can clean all kinds of debris from the lawn. In the ancient time, these rakes were being used to rake leaves during the winter. 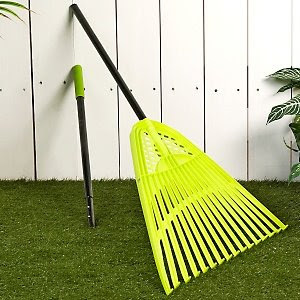 But in modern socity, rake is the ideal tool for reaching under bushes and digging out all the decaying leaves, twigs, debris and junk that get stuck in there. - Used like a broom to pull leaves and debris past the user. - May have a straight or round leading edge. - Used to pull leaves and debris toward the user. - Also used to gather up heavy trash such as sticks and stones. - Has a wide head braced with brackets attached to the handle. - Used for spreading dirt, gravel and sand. - The flexible tines may have a straight or rounded edge. - Used to gather light debris such as dry leaves or grass. - Teeth should be evenly bent for best raking results. - Has a level head set close to the handle. - Used to break up and smooth soil after it has been spaded and cultivated. - Has sharp, curved steel teeth to pulverize dirt clods. - The straight back is good for leveling the soil for planting. - Used to remove thatch and dead grass from the lawn. - Pointed on one side for pulling and rounded on the other for pushing. - The wheeled version rolls along the ground. It digs as it is pushed forward and cleans itself of debris as it is pulled backwards. - The half-moon version does not have wheels. The user drags it along the ground. The pull stroke digs up the thatch, while the push stroke cleans. - Rake head is attached to the handle with a long, curved bows extending from each end of the head. - Handles are usually 48" to 54" long. At last, I will introduce some tips for choosing rakes. You'd better look for one with a tension bar across the tines, which distributes stress and prevents the tines from twisting and breaking; avoid plastic rakes, which break quite easily. There are also smaller rakes, some are small enough to be held with one hand, that are effective for tight or hard-to-reach spots. Garden trimmers, cutting greenery, can trim right up to trees, steps, and rocks. To give your newly mowed garden lawn that finished look, you need a trimmer to tidy up the edges of your lawn, and reach into the areas of your garden the lawn mower was unable to get to. Many can also accept a metal blade for leveling tough scrub and small saplings. - Similar to a draw-cut trimmer, but has two moving blades instead of just one. - Operates with side-to-side pressure, like ordinary household scissors. - Good for a variety of cutting applications. - Has one stationary lower blade and one moving upper blade. - Operates by an up and down squeeze of the handle. - Blades are typically tempered steel. - Used for edging thick sod around walks, flowerbeds, trees and shrubs. - Has a long handle with a sharp, high-carbon steel blade. - Used for a variety of lawn and garden cutting applications. - Uses a cam located between the handles with an off-center pivot that increases the cutting efficiency. - Reduces the effort required to squeeze the handles. - Designed for one-handed use. - Has a safety lock or catch to hold blades together while not in use. - Comes in single- or double-wheel models. - In the single-wheel model, a rubber-tired wheel moves along the walk or driveway and turns a cutting blade against a cutting edge. - Teeth float above the bottom trench to cut grass without being clogged by stones, sticks and other debris. - Used for a variety of cutting applications. 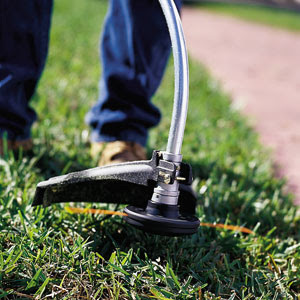 - Has long handles to relieve crouching and allows user to stand while trimming grass. - Some models have a swivel head for more versatility. At last, stepping stones and other obstacles can all cause damage to the blades of your lawn mower. A strimmer usually has a nylon cord, which is housed in a coil. Any damage the object does to the cord can be put right by pulling more cord out of the coil. This is the most important reason that we choose the garden trimmers. As we are know that home repairs are so expensive. Perhaps that's why many women begin doing some small and large home repair jobs (dishwashers, refrigerators, ovens and ranges, washers and dryers, trash compactors, garbage disposals and more) instead of paying someone else. You may need to hire a professional electrician who can set up outlets, surge protectors or any other wiring needed, as well as ventilation, lighting, and heating and cooling systems. These must connect to an existing circuit breaker, or you may need to install a new circuit breaker for your workshop. Depending how you planned your workshop, make sure to install individual outlets for your large power equipment with ground fault circuit interrupters to prevent electrical shocks from occurring. Plan your outlets every three to five feet apart to minimize the use of extension cords. Too many extension cords can tangle up and create a situation in which you could harm yourself, or cause frustration as you try to tug them around. Make sure you or your electrician installs the outlets high enough to have access to, as equipment or projects on the ground can block outlets that are set near the floor. After the wiring is done, consider how your lighting will be set up. You will want to prevent is your lights from going out if a circuit is tripped from using your equipment. Lighting experts recommend fluorescent overhead lights, which are energy efficient and inexpensive. Portable lights are very bright, providing enough illumination to specific areas such as shelves and cabinets where shadows are cast, and can be dragged around with you as you move. Track lighting is useful if you want to redirect light from one area to the next. As you work on your home improvement projects in the workspace, your equipment will generate heat and dust particles, causing you to become irritated and hot, or have difficulty breathing. With proper ventilation and a cooling and heating system, you can create a breathable, relaxed, and workable environment. A ventilation system can be set up through your ducts to collect dust particles and vent them outside, although this can be rather costly. An inexpensive way to properly ventilate your work area is to buy a fan that draws fresh air in from the outside and expells stale air out from the inside. Open up all windows and doors to help ventilate a room. A cooling and heating system is necessary when temperatures in your area tend to change drastically and when to much heat is released from using power equipment. A cooling and heating system can also protect your tools and equipment from rusting and becoming damaged due to climate changes. In one word, home women will not need to scare of those home repairs. One you begin to understand them, you will find it is so easy for you actually!